Continuing our learning series on auditing, today we create a new audit specification (as explained in last week’s post). 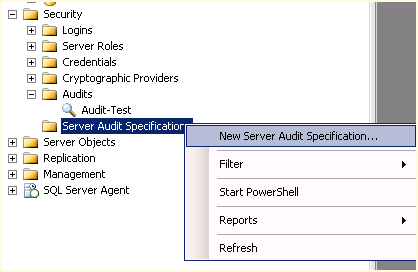 Remember, in order to create a new server audit specification, you must have created a new server audit. This is a one-to-one relationship and in order to actually collect auditing information both objects are required. Think of it like an order table that has to have an order lines table in order for a sales order to be made, if that helps your understanding. 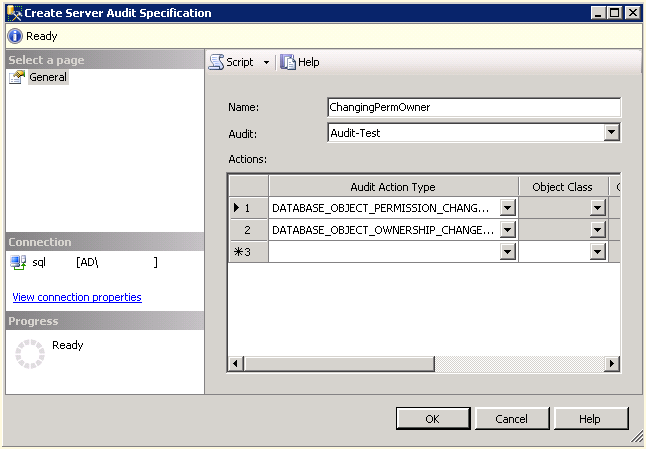 In the security node of SQL Server Management Studio, right-click on Server Audit Specification and select New Server Audit Specification, as shown in Figure 1. Right-click on the Server Audit Specification in the Security node and select enable to activate your new audit specification. Posted on January 22, 2013, in Auditing and tagged Auditing, security. Bookmark the permalink. 2 Comments.